I first decided to attempt a 2017 thru-hike of the AT in March of this year. I brought this idea to my best friend, Sarah, who at first thought I was out of my mind but, after about a week of talking about it and researching she decided that she wanted to be out of her mind too. Together we pitched our grand plan to my cousin, Amber, and it took her about .001 seconds to decide she’s coming too. I have always loved her enthusiasm! So, with that, I have my “crew”. (We don’t have trail names yet, so stay tuned). Now that I’ve somewhat explained the back story, I figured it’s about time I introduce myself and explain why I am about to spend half of the next year in the woods. As I’m sure you know by now, I’m Danielle. That’s it, plan and simple. Just me. I’m from a small town in Virginia and haven’t lived anywhere else. I enjoy exercising, sports and running in races. The longest race distance is a half marathon, but if this thru-hikes goes well I’m hoping to one day do a marathon. I have always loved any type of sport, both playing and watching. 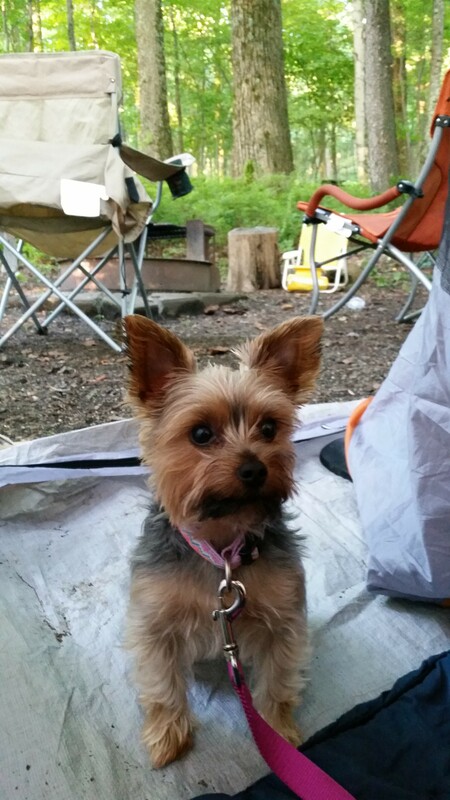 My Yorkie Wicket and I enjoy being outside, going for walks, camping, and day hikes on the Peaks of Otter. I don’t have a fancy job or title. I don’t have thousands or even hundreds of followers on my social media pages. I’m not anyone special. But, I am ready to make a change in my life. I am strong and determined. I am supported and loved. And so, I’m ready to make the most incredible journey of my life. As mentioned before, I decided to take on the Appalachian Trail in 2017 in March and the wait has been torturous. There have been so many days where I have said, “I’m leaving now.” or “Why can’t I just go now?!”. Often times I’ve even wondered if I made this decision too early. My head is constantly thinking about the hike. The gear. The preparations. The money. The bugs. The weather. But most of all, the freedom. The first and most driving reason for wanting to go on this hike is the fact that I need change. Mostly, I need to change my direction in life because, honestly, I don’t really have one. I’m 10+ years out of high school and I have yet to find my “calling”. I’ve tried odd jobs here and there, but nothing has really captured my interest or passion. All I know is I love anything outdoors, anything athletics related, and anything challenging. Hence, I’m hiking the AT. I’m hoping my experiences on this thru hike will open my eyes, heart, and future to wondrous opportunities. Expounding on my reason of change, I am also hiking the trail to prove to myself that I can do it, to get more in touch with myself, and to change my own opinion on the person I am. 3 years of college experience and classes; what do I have to show for it? Nothing. I never finished. Mostly because, as mentioned, I never felt drawn or an interest in one particular field. Ever since my last year of college I have kind of felt disappointed in myself. So, I will finish this hike, even if it takes me a year! (Let’s hope not that long though, money doesn’t grown on trees, ya know.) I will change my opinion of myself and make my family proud. I will. Because I can. Now, to end on a fun and positive note, I am hiking the Appalachian Trail because I want to live and experience everything I have been researching, watching, and looking at through pictures. I want to have stories I can tell for the rest of my life. To meet people who would become friends and whom I can share the bond of being a fellow hiker with would be amazing. Future thru hikers can follow my journey and I would hope I can inspire them as the 2016 thru hikers have done so for me. What a fascinating and unbelievable experience living in the woods will be! So, hurry up March! I need things to happen NOW! My name is Danielle, from Virginia, and I'll be 28 once I start my 2017 NOBO thru-hike in March. I've always been active and considered myself athletic, however, I have never even been on an overnight hiking trip. I have also only been camping maybe a grand total of 4 times, so I'd consider myself new at this whole hiking thing :) Blogging is something I have never done before either, so please be kind! I can't wait to share my experiences and journey with everyone! Take care! Wow, I could have written that. I decided to thru hike in Jan my brother is coming with me, and right before I read your post I just rearranged the gear in my pack for the gazillionth time. We will be starting mar 1st hope to see ya good luck. That’s awesome, Mike! Maybe we’ll stumble upon each other out there! Thanks for the comment and good vibes! Good Luck, thats awesome I decided in March of this year to hike next year too! With an early April start date. Happy hiking and good trails. See you all out there!! Planning on starting 3/29/17! That’s awesome! We’ll hopefully run into you along the way!